This article was the basis of my recent presentation at Low Carb Down Under on the Gold Coast. If you want to dig into the detail on the latest science on satiety and how you can manipulate your food choices to help control your appetite, then read on…. The reasons we eat more of one food than another are complex. Your appetite is driven by instincts that ensure your survival rather than helping you get abs or look good naked. …we reach for our favourite energy dense “comfort foods”. We develop preferences, unconscious biases and mental narratives to explain why the things we like are good and why the things we don’t like are bad. In reality, all of these factors play a role in whether we consume more food than we need to. It can be hard to quantify the relative benefits of the food we eat. Controlled human feeding studies provide limited information due to their short duration and lack of resemblance to how we live and eat in the real world. Nutritional epidemiology has done little to separate bias, ethical convictions and beliefs to identify practically applicable scientific principles of nutrition. It’s hard to validate the observations without large and expensive randomised controlled trials. Discussions about satiety and satiation often get bogged down in complex mechanism theories that are also hard to validate and practically apply in the real world. But now, with the widespread use of food tracking apps and the advent of big data, we can identify the properties of our food that tend to help us to reduce our food intake without excessive hunger. In an effort to progress our understanding of satiety, this article details the analysis of more than half a million days of food logs to understand how various parameters of the food we eat (e.g. protein, carbohydrates, fibre, fat, sugar, starch and energy density) influence whether a food or meal will fill us up or leave us hungry and eating more than we need to. Finally, we detail a novel satiety formula that enables us to rank the foods that are likely to be more satiating vs the ones that are more likely to lead us towards obesity, diabetes and a raft of diet-related metabolic diseases. As shown in the chart below, the Nutrient Optimiser Satiety Score correlate really nicely with the laboratory data. It seems we now have a reliable way to rank the foods that will help us eat more (to recover from vigorous exercise) or eat less (to lose body fat). Satiety is the feeling of fullness that lasts for a period after a meal. A satiating meal will make you feel full with less energy and stop you feeling hungry for longer. Perhaps the most noteworthy prior study on satiety is a 1995 laboratory experiment undertaken at the University of Sydney (A Satiety Index of Common Foods, Holt et al 1995) where they fed 1000 kJ of 38 different foods to participants, measured their perceived hunger every fifteen minutes and then how much they ate at a buffet three hours later. The resulting satiety index scores for each food are shown below. White bread was given an arbitrary score of 100%, so anything with a score greater than 100% is more satiating per calorie than white bread, and vice versa. The least satiating food was a croissant (with a satiety score of 47). The most satiating food was a plain boiled potato (with a satiety score of 323). The charts in the study are hard to make sense of, so I re-plotted the data in an effort to understand how each parameter influences satiety. Energy density is the weight of food per calorie. The data support the view that foods with a low energy density like oranges and grapes are satiating. They make us feel physically full with less energy. Foods with more protein tend to be more filling. This is where things get a little more interesting. Like many things in nature, the relationships between fat and satiety seems to follow a ‘U-shaped curve’. Low-fat foods are harder to overeat than higher fat foods. Foods that are a mix of fat and carbs (e.g. cake and doughnuts) are less satiating. Higher fat foods like egg and cheese are more satiating than those that are a combination of fat+carb. High carbohydrate low-fat foods are hard to over-consume. Low carb foods are satiating. Again, it’s the fat+carb combo that is hardest to resist. But rather than just looking at carbohydrates as a whole, we can break out the separate components of fibre, starch and sugars. Foods with more fibre tend to be harder to overeat. Very high starch, low-fat foods without added fat are hard to overeat. Low starch high protein foods are satiating. Again, it’s the foods that are a mixture of fat and starch that are easy to overeat. Both high sugar juicy fruit and low sugar foods were found to be satiating. The participants tended to overeat foods with a mixture of fat and sugar (note: the doughnut has a little sugar but lots of starch). While this controlled laboratory study provides some interesting insights, there is not enough data to confidently deduce a strong relationship to predict the satiety effect of different foods not yet tested in the lab. Recently, my Nutrient Optimiser partner Alex Zotov stumbled across a massive data set of half a million days of MyFitnessPal food logs that have given us some fascinating insights into what helps people to manage their appetite with less hunger. Twenty-three years after the Holt satiety study, our hope is that the analysis of this data will help to refine our understanding of satiety. As you can see from the chart below, here is a strong correlation between the observations from the controlled laboratory satiety data and the Nutrient Optimiser Satiety Index deduced from the free-living food logs. The data used in the analysis is from a ResearchGate publication MyFitnessPal Food Diary Dataset by Weber, Ingmar & Achananuparp, Palakorn (2016). MyFitnessPal has more than 150 million users from all over the world and many people make their MyFitnessPal diary public. The authors ‘scraped’ the public food diaries to compile an anonymised database of 587,187 days of food diaries logged by 9,900 MyFitnessPal users who had been recording for more than two months. While there are undoubtedly inaccuracies in self-reported data, this is more than 1600 person-years of data! While this data is essentially nutritional epidemiology on steroids, it gives us the opportunity to validate and refine the 1995 Holt laboratory data and validate our other theories about satiety. Whether or not the MyFitnessPal users weighed and measured their food precisely doesn’t stop us using this data to make useful observations about the properties of our food that affect whether we eat more or less. While there will be inaccuracies, they will largely be consistent across the ten thousand users and are not highly correlated with the parameters we are interested (i.e. protein, fibre, starch, fat, and sugar). Remove food logs with a goal intake of fewer than 1000 calories per day and greater than 2500 calories per day (to focus on people trying to lose weight). Remove days where people consumed less than 50% of their goal or greater than 300% of their goal intake (to remove external factors like fasting, parties or people not completing their food log). As shown graphically in the chart below, the vertical axis is based on the users’ actual intake for the day divided by their goal calorie intake. If this number is greater than 100% it means they reported consuming more than they planned to for that day. If this number is less than 100% then they recorded less than they planned for the day. After cleaning, the data we grouped it in twenty ‘bins’ based on each parameter and calculated the average recorded calories/goal for each ‘bin’. By using % of goal intake, we remove the requirement for the food diaries to be perfectly accurate and we can observe the general trends to see if they align with the laboratory data and our other theories about what fills us up. While you may feel like you have a unique metabolism and have to find what works for you, I think it’s useful to look at what tends to work for most people most of the time. The chart below shows that people who report eating more protein are more successful in meeting consuming less than their calories target. Also shown on the chart are example foods that align with that macronutrient percentage. The average protein intake for Americans is less than 12%, which coincides with the level in the chart above where the satiating effects of a higher protein intake start to kick in. Left to our own devices, it seems that we optimise our diet for maximum energy intake. The chart below shows that protein intake in the US increased after the Great Depression in the 1930s as America became more wealthy. In 1977 the Dietary Goals for Americans were introduced recommending that people cut back on saturated fat and cholesterol, and since then the percentage of protein has decreased. I have shown the protein frequency distribution on the chart below. While the MFP users were consuming an average of 21% protein (which is higher than the average US intake), the satiety response curve suggests that they would get an improved satiety response with more protein. What is really interesting here is that it seems that American’s, on average, have optimised their diet for the protein intake that minimises satiety and enables them to take in more calories. The analysis of the satiety response to % indicates that a very low-fat diet is hard to overconsume. This observation aligns fairly well with the 1995 Holt laboratory satiety data. Traditional cultures that lived on a diet of rice and vegetables (without added oil) tend to be lean and long-lived (e.g. the Kitavans and Okinawans). However, given the opportunity, we tend to gravitate to an equal mixture of fat and carbs the enables us to consume more energy. There seems to be some improvement in satiety with higher fat levels when we move from the fat+carbs danger zone to more fat+protein. However, very high-fat intakes (that are only possible with large amounts of added fat) aren’t satiating. It seems once we remove the protein from the fat we get a decrease in satiety. The adage of ‘eat fat to satiety’ seems to be an oxymoron. Encouraging people to eat fat until they feel satisfied is likely to lead many to eat more than they would if they prioritised protein and/or fibre. The frequency distribution histogram below indicates that the MFP users were consuming an average of 34% fat. Meanwhile, the average US fat intake of 42% corresponds with the hyperpalatable fat+carbs zone. The chart below shows the plot of % carbohydrate vs satiety. In the centre of the chart, we see that on a calorie for calorie basis, foods that are a mixture of fat+carbs tend to be the easiest to overconsume. This observation also aligns with a recent study showing that foods that replenish our carbohydrate and fat stores at the same time provide a double dopamine hit. We get an improvement in satiety when we reduce carbohydrate intake and move away from the carb+fat danger zone of food combinations that do not occur in nature. Many people report an improvement in satiety and a spontaneous reduction in appetite when they reduce the carbs in their diet. The MFP food log data indicates that the benefit of a low carb high-fat diet come from the low carb component rather than a focus on high fat. It’s likely that with a reduced carb diet the improved satiety leads to a reduced intake which generates endogenous ketosis (i.e. from your own fat stores). However, when we move further to the left we get a higher energy density and less fibre so the appetite suppressing effects of low carb diet diminish. However, the frequency distribution chart shows that few people are actually achieving the appetite suppression benefits of a high carb low-fat diet, but rather most people gravitate to the danger zone of moderate carbs which leads to poor satiety. On average, the MFP users were logging 43% carbs which is slightly below the average US intake of 46%. It seems our appetite leads us to optimise our diet for maximum calorie intake and foods that are a mix of fat and carbs if they are available. High carb (> 60% carbs) low fat (< 30%). A low carb approach with (< 30% carb) with higher protein (> 30%). The chart below (based on data from the USDA Economic Research Service) shows that, with increased food processing, America’s diet has tended towards a similar level of fat and carbs in percentage terms. This mixture of fat and carbs enables us to consume more of the high-profit margin hyperpalatable processed foods that food manufacturers are eager to sell us. As shown in the chart below, our growing obesity levels have risen in parallel with an increasing supply of food. Similarly, China has also been able to double their calorie intake mainly by adding vegetable oils to their diet. This has resulted in a similar increase in obesity rates that we see across the world. Rather than just looking at carbohydrates as a whole, we can also look at our satiety response of fibre, starch and sugar separately. Foods with moderate levels of starch are easier to binge on. However, foods with a lot of starch and very little fat seem to be more satiating. But not many people eat more 50% starch, so we don’t have reliable data to understand what happens at the extremes. However, once we add oil, we get the potato chip or buttered potato which is hyperpalatable. Lastly, we have sugar, which (surprisingly for some) seems to have a positive effect on satiety. While sugar raises insulin more than fat in the short term and makes foods more palatable, it seems that high sugar foods can be more satiating (at least relative to fat). People injecting (exogenous) insulin on a high carb diet will often put on weight and experience an increase in appetite. This observation has led many to believe that foods that cause (endogenous) insulin to rise more in the short term cause weight gain, overeating and poor satiety. However, it appears that this is not necessarily the case. While the data doesn’t tell us what proportion of the sugar is added or naturally occurring in fruits and vegetables, it’s worth noting that foods that are naturally high in sugar often have a lower energy density which makes them harder to overconsume. Interestingly, Holt et al, in another paper discussing their data noted that foods that raise (endogenous) insulin more in the short term actually tend to promote satiety. Due to concerns around excess High Fructose Corn Syrup, soft drinks and the approval of artificial sweeteners like Splenda in 1999, the USDA food consumption data indicates that Americans started consuming less sugar, with a 15% decrease in added sugars since then. While foods with added sugar are likely not the most nutritious choice, it doesn’t appear that sugar is the primary culprit for the obesity epidemic. Higher fat foods, and especially the starch+fat combination appears to be a bigger issue that sugar itself. For many people, increasing vegetable intake (which contain sugar) will provide a net benefit by reducing energy density, increasing fibre as well as providing a complementary nutrient profile to an animal-based diet. If you have diabetes, the Nutrient Optimiser will help you titrate down your insulin load to identify foods that will help you stabilise your blood sugars while also maximizing nutrient density. Note: Sugar was not included in the final satiety formula because, once energy density was considered, it didn’t further improve the correlation with the Holt satiety data. So, the Nutrient Optimiser Satiety Score doesn’t actively promote sugar but it also doesn’t bias against fruits and vegetables. The chart below shows the satiety relationship between each of the components of our food for comparison. Overall, protein, fibre (and possibly sugar) appear l to increase satiety, while fat, starch and non-fibre carbohydrates tend to cause us to consume more calories. Although we can separate the satiety effects of individual macronutrients, we don’t consume macronutrients in isolation. Foods come packaged together. We never eat foods that are 100% protein, 100% carbs or 100% fat. So I thought it would be interesting to look at combinations of nutrients in order to understand which ones we should avoid versus the ones we should prioritise for different goals. The chart below shows the satiety response of the food combined with the biggest positive effect (protein+fibre) and negative effect (starch+fat). Hunger increases exponentially as more of our energy comes from fat+starch. Managing or reducing the proportion of energy in your diet from fat and starch will be the most effective thing you can do to manage your appetite. When we look at the foods that have more of their energy from fat+starch we can start to see why this is the case. Regardless of willpower and dedicated weighing and measure these people will likely struggle to maintain a sustained calorie deficit. It’s the “comfort foods” like crackers, doughnuts, cookies and lasagne that you will go back to for seconds and not stop until they’re all gone. 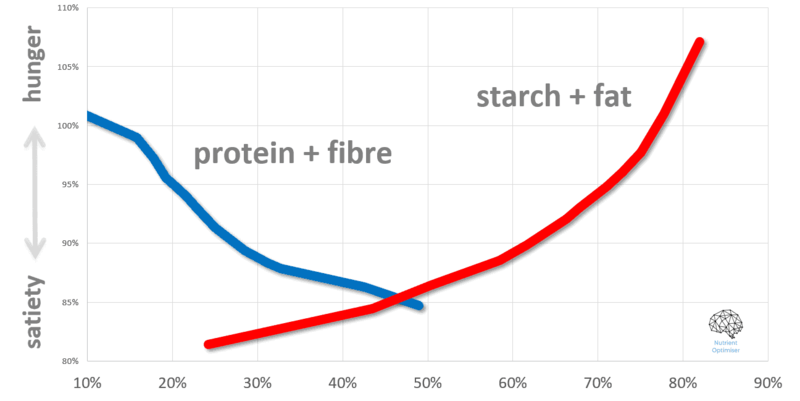 The frequency distribution shows that there are a significant number of people getting a lot of their energy from the starch+fat combination. Wheat and corn are typically harvested in summer and autumn while, before modern agriculture and refrigeration, we would have relied more on high-fat animals during winter (at least in temperate climates away from the equator). As a general rule, foods that are a mixture of fat and starch do not occur in nature! Whether by luck or good planning, the food industry seems to understand the hyperpalatability of fat+starch. It’s the added fats and flours that have increased the most in parallel with the growing obesity epidemic. In 2010, 60% of the energy in the American diet came from added fats and oils or grains and flours compared to only 46% in 1970. In earlier times, before modern food processing, you can imagine this would have been much much lower. If weight loss is a goal, you should reduce the foods and meals that contain both starch (e.g. wheat flour, corn starch etc) and added fats (e.g. canola, soy oil, rapeseed oil etc) together. Rather than just avoiding the “bad” foods, this chart shows the foods with more fibre and protein that will provide greater satiety. These are the types of foods that are naturally available in spring or the style of food that someone following a Protein Sparing Modified Fast style diet would consume. Rather than just avoiding hyperpalatable fat+starch foods, these foods will provide you with the nutrients you need with less hunger. This chart shows the satiety response from the combination of fat and carbs. Once we get beyond about 65% of energy from fat+carb, your hunger will ramp up, and allow you to consume more energy. Fat+carb foods are rare nature, although there are a few examples. Nuts like acorns contain a mix of fat and carbs to help animals build fat for winter. Breast milk has pretty much an equal mixture of fat and carbs to allow a baby to grow quickly. These foods would also be helpful for a bodybuilder wanting to bulk up. Thinking in terms of fat+carbs with less protein will help you consume more calories without resorting to the hyperpalatable fat+starch combination (aka dirty bulk). Another way to look at satiety is in terms of oxidative priority and the storage capacity of each macronutrient. Satiety is correlated with our storage capacity for each macronutrient. As shown in the figure below we have very limited storage capacity for protein (360 to 480 calories worth of labile protein in the bloodstream) and a little more for carbohydrate (1200 to 2000 calories worth of glycogen in the muscles and liver). We also find it hard to convert protein to energy (25% losses in conversion), easier to convert carbohydrate to energy (8% losses) and very easy to convert fat to energy (3% loses) or convert it to fat if not used. We don’t over consume protein because we have nowhere to store “too much” of it and it’s hard to convert to energy. Meanwhile, we have more room to store carbohydrates as glycogen in our liver, and we have virtually unlimited capacity to store fat. Given the opportunity, we gravitate to foods that contain fat+carbs together (with lower protein) to ensure we have enough fat to survive the coming winter. This is likely the reason why we always seem to have a “dessert stomach” after a hearty meal. Your protein stores are full, but you have plenty of room for carbs and nearly infinite room to store fat. The bottom line is that, if we want to get abs, avoid diabetes, reduce our heart attack risk, and avoid Alzheimers and dementia, we need to reduce the amount of fuel that we line in front of our fat stores. If we only have foods available that fill one tank at a time, there is a natural limit to the amount of fuel we can fit in. However, modern food processing gives us the ability to hack our natural satiety signals by filling all fuel tanks at once. Armed with this understanding, we can reverse engineer our gorge instincts to optimise your food choices for maximum satiety if your goal is weight loss. The aim of this analysis was to refine the Nutrient Optimiser algorithm to identify optimal foods and meals for different goals. We combined the various satiety relationships described above into one formula to calculate the Nutrient Optimiser Satiety Score. The chart below shows that we get a good alignment between the Nutrient Optimiser Satiety Score and the laboratory satiety data from the 1995 University of Sydney laboratory study for the 38 foods already tested. The R2 of 0.6 indicates that the new satiety score using the MyFitnessPal data provides a good correlation with laboratory directly measured data. We can now identify foods that will maximise satiety and help maintain a healthy weight with less hunger, deprivation and less reliance on willpower. The satiety data is even more useful when combined with other parameters such as nutrient density or insulin load. This chart shows satiety vs nutrient density for plant-based foods. (To look at the data in more detail click here). We can see that processed grains are clustered towards the bottom left corner while vegetables are generally towards the top right and legumes towards the centre. While vegetables alone might be useful for weight loss, most people following a whole food plant-based dietary approach eat nuts and legumes to be able to get in enough energy. Egg whites are the most satiating option; however shellfish towards the top right of the graph will provide high levels of satiety and nutrient density. This chart shows just a handful of popular foods to demonstrate how we can use this data. Many people start out with a hyperpalatable grain-based diet. Transitioning to keto or low-carb foods will help them stabilise their blood sugars and provide energy. However, if they want to continue to lose fat, they ideally need to move further along the satiety path while keeping their insulin load low enough to keep their blood sugars under control. As they lose weight, they will come within their personal fat threshold, their blood sugars will stabilise, and they will be able to ramp up their satiety even further. The chart below shows the satiety score vs insulin load for plant-based foods. If you are looking to lose weight and control your blood sugars, you should avoid the processed grains toward the bottom left. This chart shows the satiety score versus keto score for animal-based foods. It’s interesting to see that, while a carnivorous diet cuts out lots of nutrient-dense vegetables (which not many people are eating a significant amount of), it also eliminates low satiety, insulinogenic nutrient-poor grains from the bottom left corner! Perhaps this is the primary reason that the carnivorous diet is developing such a following. While the purpose of this work was mainly to refine the third component of the Nutrient Optimiser algorithm (in addition to nutrient density and insulin load) we have pulled out one element of the main Nutrient Optimiser program into the Never Hungry Diet web app. Our goal was to create a simple app that you could take shopping to help you decide whether a food is a good choice and should go in your trolley. In addition to showing the satiety score for your favourite foods, it also shows the % insulinogenic calories as well as the nutrient density score. If your goal is weight loss, you could set yourself a mission to ensure that nothing goes in your shopping trolley with a satiety score of less than 50%. Once you master 50%, you could try for 55% and then 60% and keep ratcheting up your minimum satiety cut off until you start to see your desired rate of weight loss on the scales. So head over now to check out The Never Hungry Diet. If you like it, you can add it to your phone for quick reference, so it looks and feels like an app. (For instructions on how to add a webpage to your smartphone home screen to click here for Apple and here for Android). Who should not eat high satiety foods and meals? Before you dive into the deep end of satiety, keep in mind that nutrient dense, high satiety foods are not for everyone. If you are a lean athlete, high satiety foods may not allow you to get enough energy to fuel your activity. People with diabetes should initially aim for a diet with a lower insulin load to help them stabilise their blood sugars. Avoiding wild swings in blood sugar will also help to manage appetite, particularly if you are injecting insulin to control your blood sugars. Eating only the highest satiety foods can be hard work. Many people don’t want to cut out all comfort foods and dive into a Protein Sparing Modified Fast. You may want to start more gently and ratchet up satiety over time to ensure you continue to get results. But if you have been trying to lose weight for a while or you have stalled then dialling up the satiety score of your diet might be the next step on your journey. I need to acknowledge my Nutrient Optimiser partner Alex Zotov’s role in the analysis of the massive data files and his role in the analysis and refining of the thinking in this article. Thanks as per usual to Ted Naiman for letting me use his awesome infographics. Also thanks to Stephan Guyenet, Cian Foley, Robin Reyes, Pat Smith, Helen Kendall and Lindesay Wilson for their comments and suggestions on the draft. Although overall protein intake has increased in absolute terms. This is anecdotal but a large, 300 calorie bowl of oatmeal leaves me feeling stuffed for hours. So does a healthy serving of microwaved potatoes with some butter or sour cream. That certainly aligns with the Holt and the MFP data. Why is Legumes, being highly satiable, and with a low glycemic load (particularly lentils), usually ignored in Primal/Low-carb/Ted Naiman etc..? For those wanting to limit animal foods and/or animal protein, for budgetary, climate, or health concerns, without sacrificing much in terms of nutrient density, is it not an excellent food? Anecdotally, I enjoy legumes greatly, and feel much, much better after eating legumes as opposed to any grain, even the most fibre-rich, whole grain products. It will keep me in or close to “the keto zone”, meaning I feel the mental benefits I find when going very low carb. And, cooking, with a pressure cooker, most phytic acid is removed, digestive issues reduced, cooking time reduced. Why do we not hail the legumes? In my analysis legumes make the shortlist if you want to eliminate animal based foods. However animal based foods tend to be more nutrient dense (not to mention bioavailable). My worry would be the effect of animal protein-centered diet of long term health and mortality. Centenarian populations have low levels of animal protein in their diet. Personally I have some animal protein (eggs, canned mackerel, chicken, lots of different animals/fish), with every meal, but filling up the plate also with legumes (lots), ultra-fibre-rich-grains (a little bit), and vegetables, gives me fibre, and still a relatively low rise in blood sugar. If I swap most of the legumes and grains for more animal protein I wory I will die earlier. Regarding protein source, most article (abstracts) i´ve read conclude that replacing some of the animal protein with plant protein will increase lifespan. Now, I´m not arguing the vegan case, but I am convinced that getting a fair share of your protein from plant sources, legumes in particular, is a good strategy for maximizing life span. And maybe health too. Thank you for your response. And thank you for your great work. Great work Marty, btw, what about Food Insulin Demand (FID) compare to Food Insulin Index (FII)? Is there are newest FID list added? Did the sugar intake really go down after 1999? In reading the book “The case against Sugar” the author argues that the food and drug administration now report sugar based on amount of sugar consumed minus what it estimates got thrown out. Thus making comparisons to previous years unreliable.